When Apple released its new iOS 5 operating system to go with its iPhone 4S, it touted a new app called "Find My Friends" as a great way to track and meet up with friends. If they agree, you can see their locations on a map on your screen. But the app's enterprising customers are apparently already finding other uses. If the online posts appearing on a chat forum at MacRumors.com are for real, "Find My Friends" may have already claimed its first marriage. "Divorcing wife. Thanks iPhone 4s and Find My Friends. 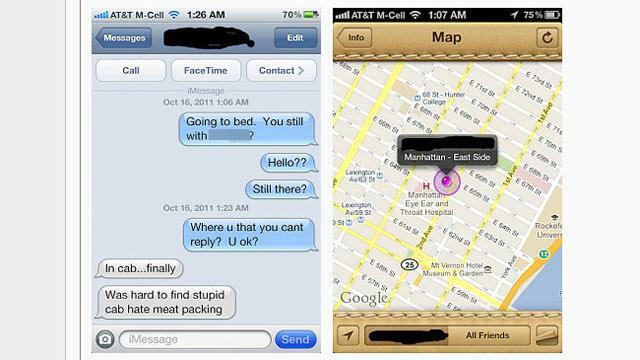 "I got my wife a new 4s and loaded up find my friends without her knowing. She told me she was at her friends house in the east village. I've had suspicions about her meeting this guy who live uptown. Lo and behold, Find my Friends has her right there. "I just texted her asking where she was and the dumb b---- said she was on 10th Street!! Thank you Apple, thank you App Store, thank you all. These beautiful treasure trove of screen shots [sic] going to play well when I meet her ... at the lawyer's office in a few weeks. "thankfully, she's the rich one." It has not been determined whether the story posted on MacRumors was, in fact, authentic, and the man did not immediately reply to a request from ABC News for comment. But more than 100,000 people have viewed the posts, according to MacRumors. More than 300 of them replied with expressions of sympathy, skepticism and -- this being the Internet -- a few less-than-savory jokes. Arnold Kim, the editorial director of MacRumors, said it was "definitely a busy thread." MacRumors did not try to verify the man's story (if, in fact, it was a man), but said everyone who registers for its forums has to validate their email when they register. "Find My Friends" uses the iPhone or iPad's built-in Global Positioning System to see your friends' locations on a map on the screen of your device. GPS can be accurate to within a few feet for civilian uses. Apple says "The Find My Friends app is a great way to share your location with people who are important to you" -- whether you're trying to meet friends at a crowded concert or make sure your kids get safely home from school. The man was back with a new post less than an hour later, including a couple of screen grabs showing the location of his wife was on East 65th St., though she sent him a text message saying, "Was hard to find stupid cab hate meat packing...."
The husband again: "She said she is in meat packing district which is on 12th street. I DONT THINK SO. Appreicate [sic] the support. not my finest hour here but going to get better soon." The new iPhone 4S and operating system have been off-the-charts successes for Apple, which said this morning that it sold more than four million iPhone 4S in three days, and that 25 million people are now using iOS 5. Technology watchers are particularly struck by Siri -- the voice-recognition "personal assistant" built into the new software that accepts spoken commands, answers questions, and is eerily intelligent in its responses. There was a memorial service Sunday night for Steve Jobs on the campus of Stanford University, near Apple's corporate headquarters in California, amid widespread stories that he was deeply involved in the next iPhone -- the replacement for the iPhone 4S. The presumably-jilted husband put up one last post Saturday night: "what really chaps my a-- is not the cheating but the fact that they were probably admiring and laughing over the new phone I BOUGHT. haha. well someone about to get the last laugh tonight." And that was the last from him. The whole thing may have been a joke, or a domestic tragedy. Ben Crompton, who writes the Pocket Lint blog, said there have certainly been other apps before, such as Google Latitude, that let you track people through GPS signals, but Apple will make it trendy. "The burning issue seems to be that it is a very powerful tool to have," he wrote, "bringing with it huge amounts of info to the user as well as delivering plenty of info about the user to others. For some this power will outdo the user's knowledge of how to use it properly." "Still, on the up side," he concluded, "maybe Siri will be able to offer some marriage guidance advice."